If you’re a fan of observing the universe, whether it through telescope, or incredible images such as this you know that galaxies come in many different shapes, sizes and classifications depending on their evolution, interactions etc. On the surface this galaxy appears as an edge on spiral with a beautifully formed material band cutting through the plane, and, well, you would be correct. But look closer, something’s not quite right with this star city. The formation of the plane, especially the “bottom” of the plane exhibits an obvious convex curve that spans the entire disk of the galaxy. So what the heck is going on?! It’s believed that this galaxy and all who reside within its city limits are undergoing “Ram Pressure Stripping” and “Dense Cloud Ablation” as they’re plowing through the Virgo Supercluster at massive speeds. The density of the material within the Intracluster medium is creating a resistance or “drag” as the galaxy moves through it. Remember there’s no real wind here, it’s the galaxy in motion creating the wind; like holding your hand out the car window. Or an even more appropriate analogy would be a skydiver in freefall. I can almost envision this image as a skydiver in freefall position being pulled by gravity out of the Earth’s skies; to the ground. That, in a nutshell is what’s happening here. 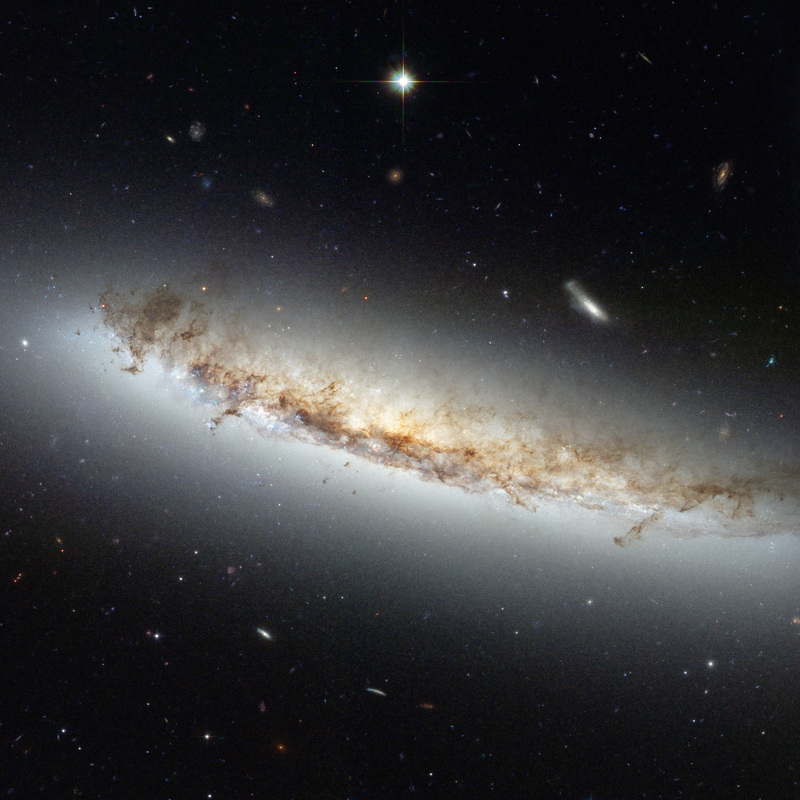 NGC 4402 is being pulled gravitationally toward the center of the Virgo supercluster and that force is disrupting the entire galaxy. It will likely end its life as a spiral at the center of the Virgo supercluster mixed in with others, creating a massive elliptical galaxy. If you look on the bottom side of the galaxy, especially on the left side you can see many exposed bright blue stars and star clusters. The rapid star formation was probably induced by the disturbance on the galaxy itself. Later, that wind blew away the material surrounding them, exposing a layer of blue stars across the bottom side of the galactic disk. Staying on the bottom side of the galaxy we also see a few vertical filaments of gas and dust that remain after all the surrounding material was blown away. Those areas were likely more dense to begin with and will take longer to dissipate which is the same process we see within supernovae and planetary nebulae. Now let’s shift our eyes past the bent plane to the top of the disk. Here we have the opposite effect as there is no well-defined boundary but instead, a haze of displaced gas and dust being blown out the back like a mass of loose leaves out the back of a pickup truck going down the street. Yes, we have star formation in the galaxy due to the perturbations within, but this stripping of material can and will likely, eventually, put a halt to nearly all star formation in the galaxy. Let’s end this with some fun with perspective. Just the thought of what we’re seeing with the topic galaxy is enough to wow anyone. Add to it the fact that we’re seeing it as it was 55 million years ago, just after most life on Earth ended with a bang. That galaxy, it doesn’t look like that anymore, in fact, it’s not even there anymore. Its remnants scattered amongst an elliptical galaxy of others that were also eaten and deposited at the nucleus of the supercluster. Also; have a look beyond to the hundreds if not, thousands of galaxies hundreds of millions of light years even further still. They too, aren’t there today……They’ve moved on and some don’t even exist at all. We’re looking at the homes of possibly billions of civilizations that may no longer exist today…..who knows? WHAT IS IT? : Edge on spiral galaxy undergoing Ram Pressure Stripping and Dense Cloud Ablation. HOW FAR AWAY IS IT? : Approximately 55 million light years & receding at 232 km (144 mi.) per second. HOW BIG IS IT? 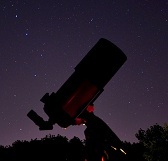 : Approximately 50,000 light years in diameter and 3.9’X1’ arcminutes on the night sky. APPARENT MAGNITUDE? : About 12 or +12. WHERE IS IT? (General): Constellation Virgo in what’s called “Markarian’s Chain” in the Virgo supercluster. WHERE IS IT? (Exact RA/DEC J2000): RA 12h 26m 07.74s / DEC +13° 06′ 42.6″. Image | This entry was posted in Astronomical Events, Astronomy (Learning), Astrophotography (DSOs), Galaxies, Images and tagged Cosmology, ESA, Galaxy, Hubble, NASA, NGC 4402, NGC4402, Ram Pressure Stripping, Space, Telescope, Virgo, Virgo Supercluster. Bookmark the permalink.